cold-pressed coffee and kombucha tea. dressing served on marble rye. please call 303-649-0726 or visit www.GrowlerUSACentennial.com. suiting their unique palate. 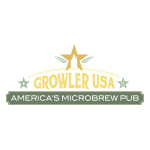 For more information, visit GrowlerUSA.com.